The wheel in the car is the most important part of its design, without which its operation is not possible. There are two basic types of tires: chamber and tubeless. First it is practically not used in the automotive industry. 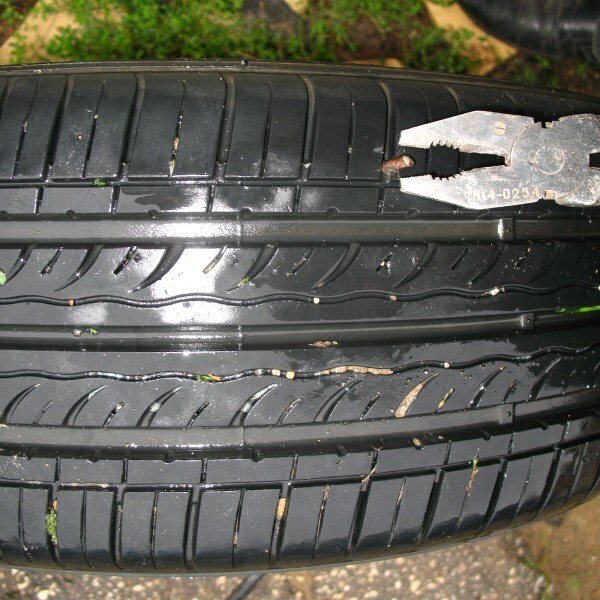 But all tires have a weak spot: they tend to get punctures, which easily can resolve itself the owner of the car and go to a professional tire shop, where to carry out long-term repairs. Buy a set for tire. Consists of strips of raw rubber, a threaded tool (like a corkscrew), needle and glue. Take a corkscrew, coat it with glue, insert it into the puncture and elaste several times, back and forth. This is necessary for clearing the channel. Insert the needle in the strip of raw rubber so that it hung down 50/50, cover with glue and carefully push into the tire. Pull the needle out very sharply, but so that the flagella remained in place, cut the excess rubber that hangs down from the outer surface of the wheel and inflate it to 1.9 to 2.0 bar. It is possible to go. Take the self-tapping screw slightly larger than the diameter of puncture, coat it with sealant and insert it into the hole. And then inflate the tyres to the same pressure as in the first step. Too hard to pump and pressure to drive fast is not recommended in this case. Use universal adhesives, which can produce rapid repair of tubeless tires with the size of the holes up to 7-8mm. When using this kind of material is restored sealing tubeless tires in those places, where the use of the above two methods are not possible. For example, the side wall. 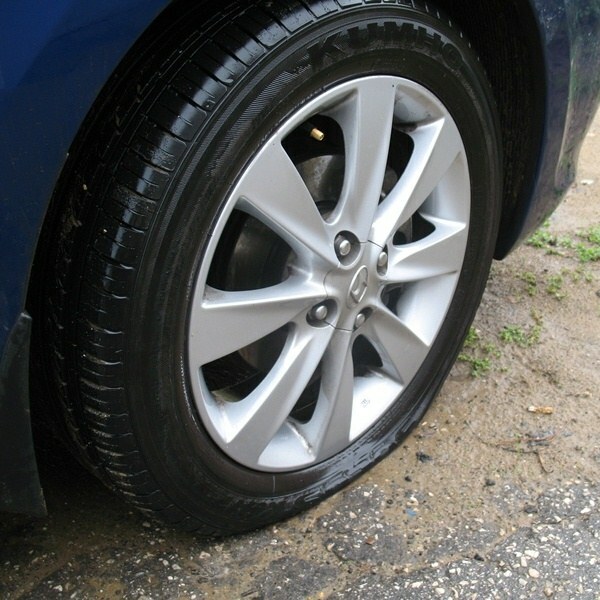 To repair tubeless tires, without removal of the wheel from the vehicle. Enough to raise the car and rotate the wheel so that the most convenient was to carry out CPR. There are low-profile and wide-base tires. The lower the height of the cord, the thicker and low profile tires you can drive up to 150 km on a good road at a speed of 60-80km/h. Currently in most modern cars set tubeless tires. These tires have several advantages over chamber tires: easy installation on the rim, the relative cheapness (no camera), less the total weight of the wheels, simple repair in case of puncture. Often you can own to seal the tire without razbaltyvaniya. Portable compressor for pumping of wheels, pliers, knife, repair kit tubeless tire, Jack, wheel key, special wheel device for fixing the car when lifting with a Jack. The car must be installed on the Parking brake to lock its position of recoil device, raise the Jack and remove the wheel. 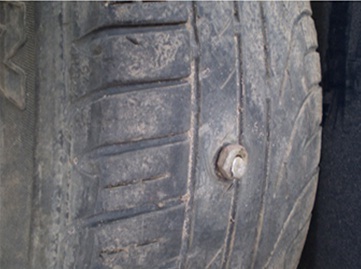 Carefully inspect the wheel for detecting the puncture site. 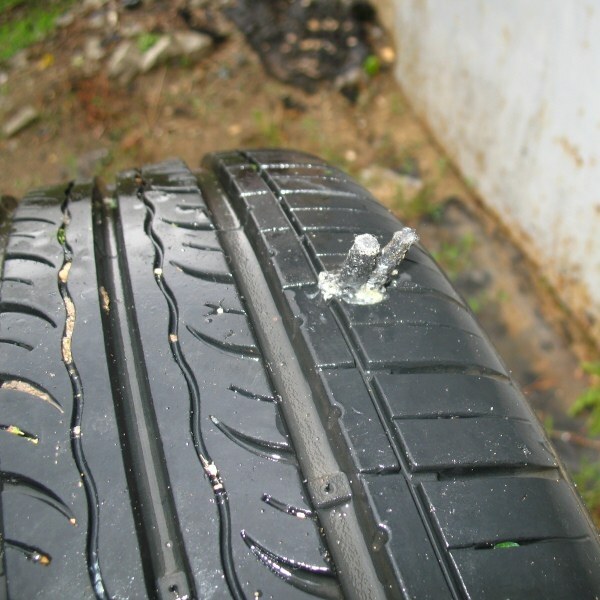 Most often, the puncture pretends to be sticking out of the tread by a foreign object (nail head or screw, a piece of glass) that you want to delete with the help of packagebut. Applied to the awl with screw tip a few drops of glue. Then the awl to dip into the puncture hole, to produce 7-10 reciprocating movements of the tool and leave it in the hole. Insert a strip of raw rubber in the awl and needle slot, to both sides was equal parts strip and cover it with a thin layer of glue. 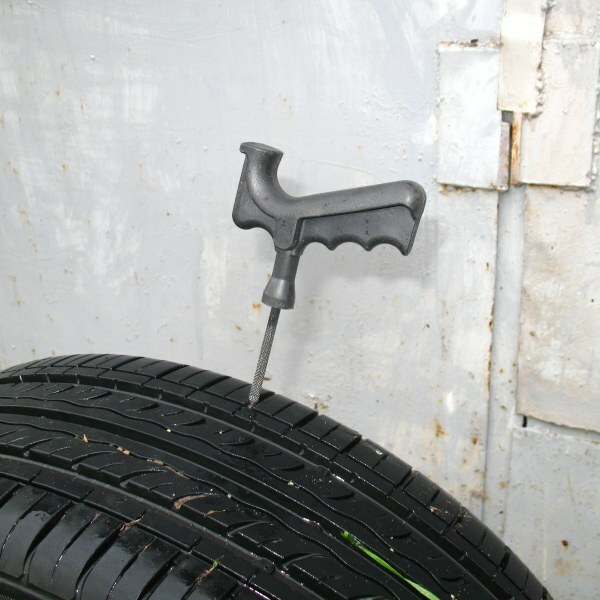 Removing the awl from the screw tip from the puncture and quickly inserted in its place the tool with a strip of raw rubber so that the outside of the tire left the tails long, 1 - 1.5 cm. Pull the awl back out of the hole. Folded double strip of rubber will remain in the hole. Cut with a knife protruding ends of the rubber, the pump wheel to the working pressure and installed on the car. This method can be used for sealing punctures of the tire tread with a hole diameter up to 10 mm. Repair of side cuts shall be carried out by experts in workshops. 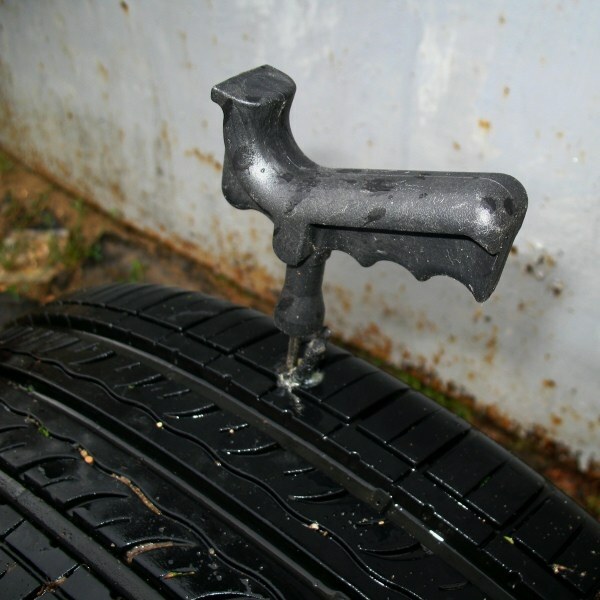 To detect the puncture site can be pouring protector tires inflated with water from a plastic bottle. Coming out of the hole the air will create a distinctive hiss. For short-term repair of large damages is permissible to use simultaneously 2 strips of raw rubber.